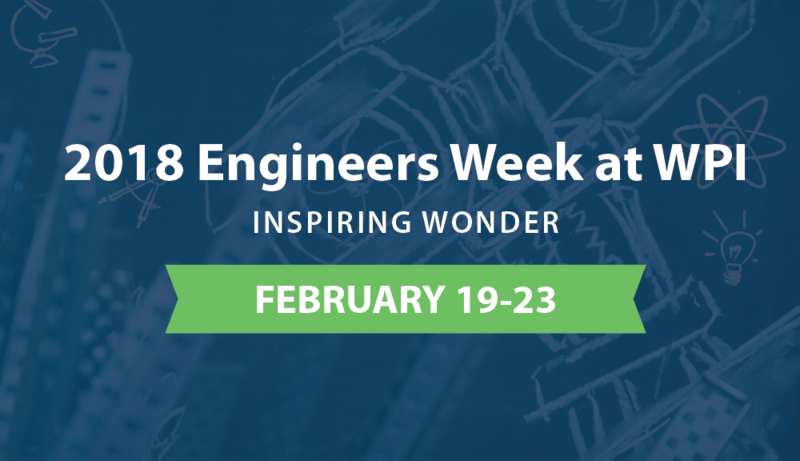 It’s difficult to imagine what life would be like without engineers, which is why the National Society of Professional Engineers established National Engineers Week. Founded in 1951, the week is a celebration of all things engineering, highlighting the contributions engineers make to society and how our quality of life is improved by their work. Thousands of engineers, students, and teachers—including those right here at WPI—are dedicated to ensuring a diverse, well-educated future engineering workforce, and the week of February 18 to 24, is dedicated to the celebration of their work. an inside look at the world of engineering. "Inspiring Wonder," the theme for this year’s week, is personified at WPI on a daily basis, beginning well before students join the community as university students, and the 2018 Engineers Week will be no different. The community will come together to bring students and educators from the area opportunities to learn, grow, and explore through interactive engineering displays and activities, movie screenings, information sessions, lab tours, and specialty programming for a variety of audiences. One of these activities is Introduce a Girl to Engineering Day. The longtime program on Feb. 21 will give 60 to 70 girls in third through fifth grades an inside look into the world of engineering. Following an overview from WPI’s Engineering Ambassadors in the morning, they'll spend the bulk of the day at hands-on project stations, three of which are sponsored by the Engineering Ambassadors, and one by a graduate student team. There’s no question that the program is popular—this year, it filled up in a little more than a day. “I think it’s great,” says Jenna Noel-Grinshteyn, associate director of outreach programs. “The fact that it fills so quickly shows that there’s a need for this type of programming and that the interest is there, even at such an early age.” Program activities are determined based on whether they’ll resonate with students, and if they’ll give them the opportunity to succeed, put their own personal touch on the activity, or spark an interest in STEM. This year, the activities list includes Makey Makey kits, the science behind fidget spinners, and more. Noel-Grinshteyn loves seeing the students come out of their shells as they work together on projects and explore different engineering concepts, but she’s just as excited for the older students who are teaching them—the Engineering Ambassadors. A campus group that invites middle and high school students to events that engage them in the world of engineering, the Engineering Ambassadors normally work with older students; Introduce a Girl to Engineering Day gives them a chance to practice discussing and breaking down complicated technical concepts in ways third graders can understand. “They’re really able to help a younger generation understand what engineering’s all about,” Noel-Grinshteyn says. The STEM Education Center also helps make engineering and STEM more accessible to younger students. The center works with educators to impact communities and give students of all ages equitable access to high-quality STEM education. As part of this year’s Engineering Week, the Center will host a free professional development session for educators of all types. The session will cover the inequalities in STEM and what strategies and practices can make STEM more accessible for all students. WPI’s campus is always busy, but Engineers Week will create an added sense of bustling excitement through teamwork and camaraderie, something Soboyejo considers his favorite aspect of the engineering community.